Spring is finally here! The weekend was very beautiful (more on that later) and I had hopes that this week would be a good one for finds. However, I feel like all I’ve seen thus far is bags and bags of yard waste – twiggy crap that only worms would want. It seems that for most people the first step of spring cleaning is to rake the yard. My thinking now is that people get to cleaning out their basements and closets a little later on. That would explain why May was such a good month for me last year. Still, I’ve made a couple of noteworthy finds in the past few days. 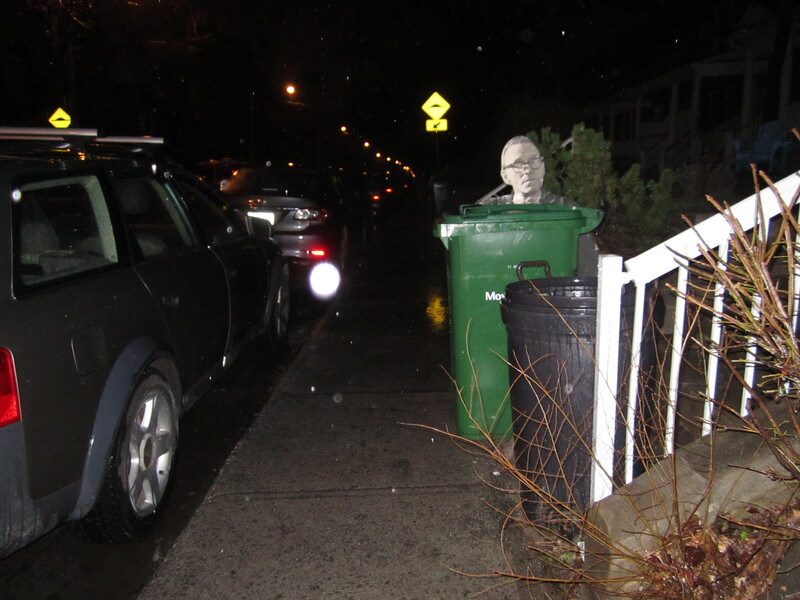 I was driving around NDG when I noticed this guy poking his head out from behind a recycling bin. 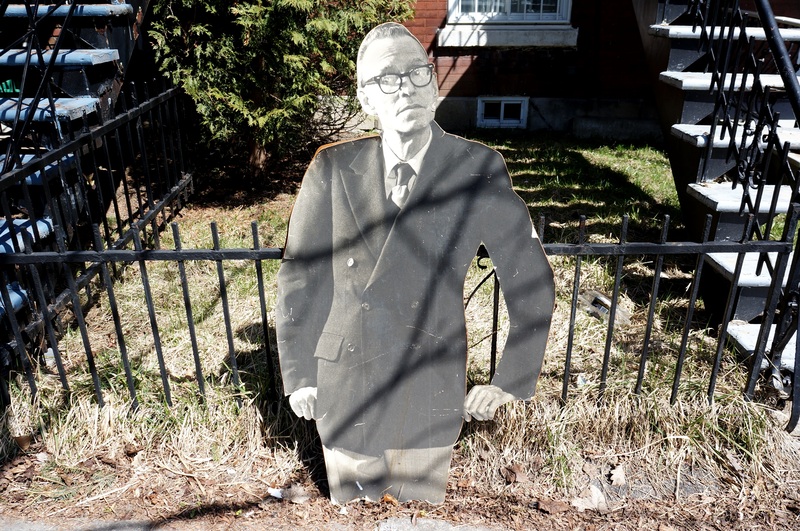 It ended being an legless full-sized cutout of some dude. His fashion sense is very 1950s or 1960s, and I’d guess it was made around that time. It makes a cool decoration so I might just keep it myself. I’d love to know who it is though – let us know in the comments if you have any ideas! My run last night was pretty quiet overall. However, I did stumble across this nice vintage chair. It’s got a very modernist look to it. 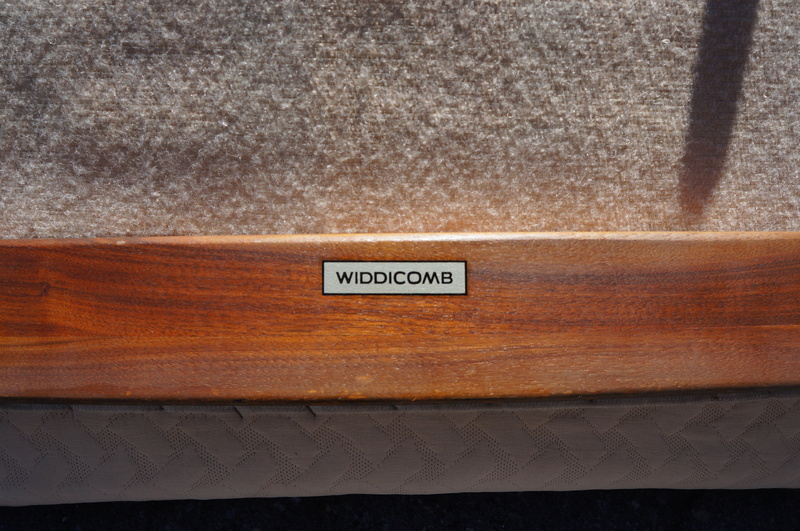 On the bottom is a label marked Widdicomb, the name of a renown American furniture company. After consulting with Reddit, I can say more specifically that it looks to be a piece from George Nakashima’s “Origin” line. Some Widdicomb pieces go for a fair bit of money. However, it’s super comfortable and I’m considering keeping it for myself. My decision on whether to keep it or sell it will depend on just how much it’s worth, as I have a hard time turning down good money for decorative stuff. There is a light stain on the cushion, and the cushion is probably a bit “saggier” than it was 60 years ago but it’s in fine condition otherwise. Paranoid, I inspected it for bugs multiple times but found no trace of them. I suspect the previous owners just wanted something new and “fresh.” Stain-free perhaps. My yard sale on Sunday went quite well! The weather was fantastic – sunny all day and about 20 degree Celsius – so I couldn’t have picked a better day. Thanks to all the readers who came by and said hello! I made just over 300$ overall, which I consider a pretty solid performance. The sale was also productive because it helped me get my stuff organized. I have a loose organization system (ie: specific boxes for ephemera, doodads, and whatever) and having everything out there made it easy for me to put things in the right places. This also made it easier to purge. I got rid of maybe four boxes worth of stuff I decided wasn’t worth trying to sell, which of course opens up more room for better things. If anyone’s curious, when I do a purge I’ll put all the stuff on the curb in open boxes, which allows other scavengers pick through it and take whatever might have any value. 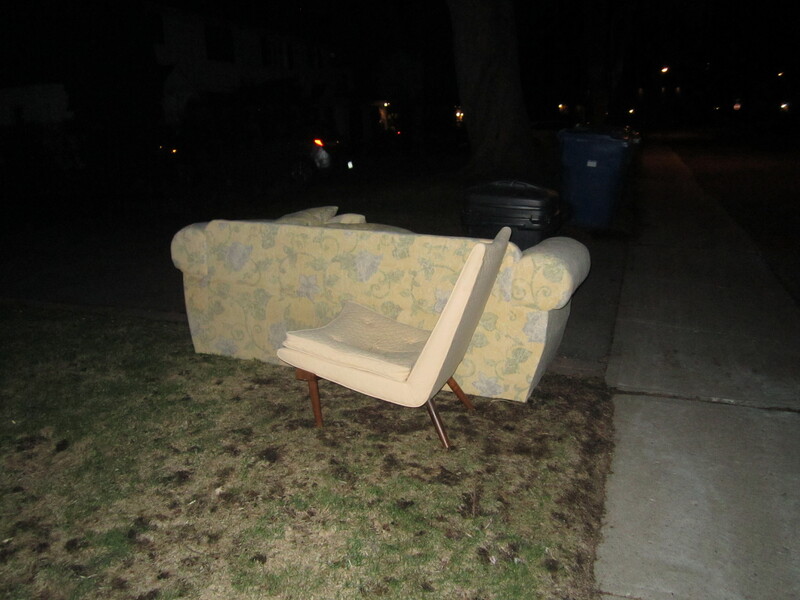 I make sure to put the boxes out only when the weather is nice, and well in advance of trash collection. 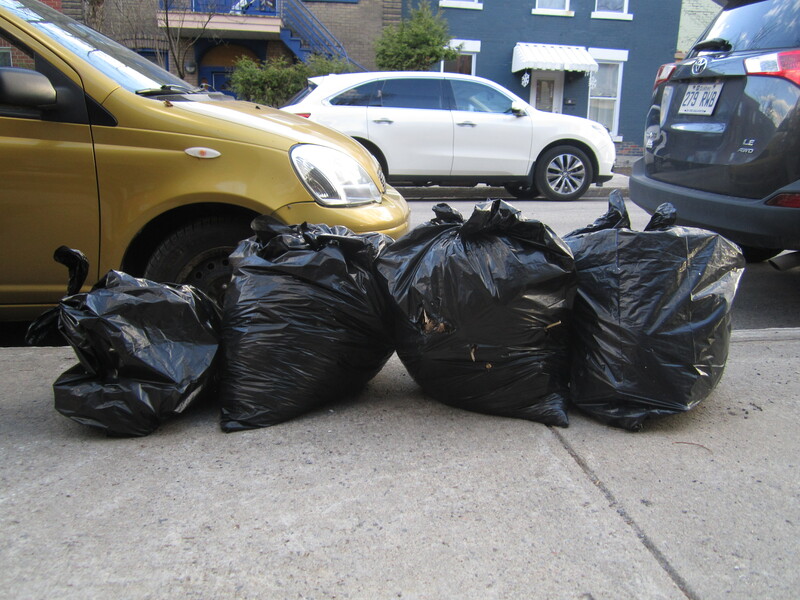 There’s plenty of pickers in Montreal, and I think this is the most effective way to redistribute my refuse. Otherwise, I got a tetanus booster the other day. It had been about 10 years since my last shot and I figured that it’s a good thing to stay on top of given my profession. I’d recommend that anyone else who digs through trash regularly (as well as those who don’t) do the same! Cool-looking dude (you could give him a tidier cut at the legs), sweet (comfy-looking) retro chair to chill on … and a great yard sale to start the season! I was born and raised in Vancouver and live in BC..But I wish I lived in Montreal so I could follow you around on your adventures.I love your posts,your writings,your description of different neighborhoods and the titles of your posts.What is also a lot of fun is to read the reader comments.Many of the readers write things that are very educational.The newspaper stories that some readers post on your blog to share with other readers are fantastic.Don”t you think?Never leave this trade for an unreal job.If need be,explore different and untried neighborhoods.Why not?What you gotta lose?Three thums up for you and your smart readers. Glad you like it! I’m sure there’s some good trash in Vancouver. When I was there I saw a lot of bins, which isn’t great, but maybe there’s some heavy trash days. Keep an eye out for houses for sale. that chair looks amazing..Don’t know much/anything about it, but somehow it looks very valuable. when you get more research on it, would love to hear. also that dude really looks like a person folks should know. maybe it was a local celebrity? radio host? if it turns out to be, might be worth bucks too. i agree cardboard dude seems familiar,not generic enough to be just a model i think,a little to imperfect,a little too human,probably a person or actor playing a role? It’s still a mystery. I asked Reddit and nobody could figure it out. Martin,your work is great.But you must explore new areas.The weather is just perfect.How about exploring Pierrefonds along Gouin and going south?What about other parts of West Island?Does Pierrefonds have garbage collection and recycling pickup on the same day?Also,start going to Verdun West,St.Henri and Ville Emard more often. I plan on exploring a bit more. The West Island is a bit far though. Lots of good garbage I’m sure, but it takes more time and extra gas mileage to get there. I’m actually thinking of exploring more eastward. I realize that while I’m often willing to travel 10km to get to Cote St-Luc (for example), I rarely even go more than 1-2km east of my present home, and don’t go to relatively nearby locations like St Michel, St Leonard, Hochelaga, the more eastern parts of Rosemont… and so on. There’s a pull to go west because several wealthy neighbourhoods are there, but there’s also great stuff to be found in older middle class and working class neighbourhoods. I do plan on visiting Ville Emard / Cote St Paul at some point, as well as the Thursday morning Verdun. It’s always a bit of a crapshoot going anywhere new though, as a lot of trash picking is being in the right place at the right time, and it’s generally not the right time in middle class / working class neighbourhoods. The West Island I may visit just for kicks at some point. But it’s too far away to add to my usual rotation. I like driving, but if I do it too much I start to hate it. I’ve done St Henri a few times in recent months, but didn’t find anything worth adding to the blog. I found a nonfunctioning ipod in the garbage in Dorval.It is still intact—there are many scratches on the screen however.How much can it be sold for?This I found by staring at a pile of eight garbage bags on the street where I live,three houses from my apartment building.It was in a black garbage bag and it was blowing around in the wind because the rest of it was stuffed with flyers and styrofoam. Depends on the model / how old it is really. Check eBay’s completed listings and see what comes up. just wanted to spread this story around.. I think it is evil what they tried to do to this man, and so glad he won…. Quebec’s rental board has sided with an 82-year-old tenant who was fighting an eviction notice after it was sent to his Little Italy apartment while he was hospitalized and fighting stomach cancer. Pierino di Tonno and his lawyer brought their case before Quebec’s rental board in early March. Hi Martin,I am tired of our throwaway society.My girlfriend is a neatness freak and does not hang on to anything.Her boyfriend and she live in the Plateau in a big 3-room apartment.Her boyfriend collects comic books (He has about 200 but the are very neatly organized).He also plays the accordion and xylophone and has collected about 200 to 300 vinyl records in about 10 plastic milk crates.He makes good money working in the finance services sector,but she keeps nagging him to get rid of the vinyl records and most of the comic books.I collect postcards and coffee table books myself.I support him over her in this regard.She calls him a HOARDER.Why is it that in our society even if someone is neat but hangs on to stuff one likes one is accused of ‘hoarding’.I like history and collectors and work a a pharmacist and in calligraphy.HOARDER has become a very,very overused term. To me minimalism is the rejection of the way of life (consumerism) that leads people to fill up cookie-cooker suburban McMansions with meaningless crap. It’s a bit of an overreaction if you ask me, but if it makes them happy it’s fine by me as long as they understand that not everyone agrees. I think a middle ground between the two is very achievable. I dislike Zen and I dislike all those people in the Plateau who are always talking of traveling,new age spirituality,minimalism and zen.There are so,so many magazine articles telling us how to get rid of things.I moved away from the Plateau and I am happier living on the South Shore.One of the reasons was I got tired of all the Zen people in the Plateau junking stuff all the time,saying we should not be attached to material things.One guy living in an apartment on Laurier put an ad on Craigslist saying he was moving to Vancouver and putting all his wordly possessions on the street.A few others did the same thing.I hate this kind of extremism.If he goes broke,I would not be surprised one bit. At least he put up a Craigslist ad. To me, that indicates that he was aware that other people might want his stuff, which I think is admirable (especially when considering other people are throwing out their working MacBook Pros). I think it’s totally fine to put things on the curb if you make an effort to tell people where to find it / indicate that it’s free with a “free” sign. I can’t say I’ve ever encountered any people that match that description throwing things out in the Plateau. Mostly it’s McGill students (when they move) and occasionally yuppies or people clearing out estate homes. I hope you go to Laval one of these days.Are garbage and recycling picked up on the same day in Laval? Can’t say I’m an expert. From my memory though the Chomedey area has same day recycling and garbage (Tuesday mornings if I remember right). 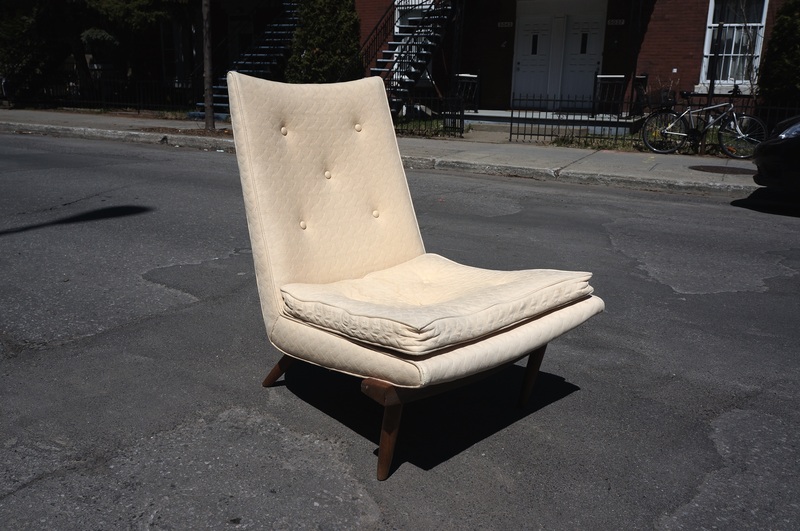 I hope you find a lot of useful trash in student-rich areas.The winter semester just got over—you may across a lot of cool furniture,lamps,etc in the student ghetto,parts of NDG,Verdun,Villeray,St.Henri,etc.Explore. I did find some great stuff in the McGill Ghetto. I’ll share that soon. I don’t really take furniture, but those kids often throw out clothes and books, and occasionally laptops, other electronics, and jewellery. Hi,Martin,they are introducing composting in more and more areas.Residents of more and more boroughs are being handed Brown compost bins for throwing out food waste.You might see fewer black garbage bags in most boroughs within two years,but many résidents may still be lazy to sort their trash. That’s a good thing I think. It means that the average garbage bag will be a lot less likely to contain gross crap than before. Also, those composting days often replace a garbage day, meaning I only have to go out once a week to see the same amount of stuff.